This is where you’ll find extended versions of WhiskyCast interviews, along with audio and video from special events that were just too long to include in a regular episode of WhiskyCast. The original idea behind WhiskyCast was to help gather oral histories of whisky, and this is a place where you can listen and learn more about the “water of life”. My mouth was puckering, trembling, and shivering all at the same time as a briny, fishy taste with just the barest hints of whisky took control of my palate – and my entire nervous system. My stomach clenched, along with the rest of my body. A few feet away, the distillery manager that presented us with this blind sample at the end of a tasting had a big grin on his face. This is the story of that whisky, and how I came to taste it in a prank worthy of an April Fool’s joke. Klaus Pinkernell never set out to bottle one of the world’s worst whiskies in 2006, but he did want to send a message. At this point, we need to backtrack to the early 1990’s. At the time, Pinkernell was visiting Islay and trying to buy casks of whisky for his private collection. He succeeded in persuading Invergordon Distillers, which owned Bruichladdich Distillery at the time, to sell him some casks that were maturing at the distillery, one of which had recently been filled with new make spirit. Invergordon closed Bruichladdich in 1994, but kept a skeleton crew on hand to oversee the maturation warehouses on site with Pinkernell’s casks and the rest of the distillery’s inventory. When Mark Reynier and his partners bought the distillery and reopened it in 2001, Pinkernell reached out to Islay legend Jim McEwan, who had come on board as Bruichladdich’s production director. After checking Pinkernell’s casks, McEwan declared the barrels as less than optimal and offered to re-cask the whisky into better-quality ex-Sherry casks. With the help of a couple of Norwegian whisky lovers Pinkernell ran into at the Bowmore Hotel, he and his friends transferred the whisky from cask to cask using an old hand pump. “It was quite hard work, but we didn’t have to do it because the Norwegians quite enjoyed it,” Pinkernell said with a laugh. By this time, Pinkernell had opened his whisky shops in Salzburg and Berlin under the Cadenhead’s banner, and had moved the casks from Islay to the warehouses at Springbank Distillery in Campbeltown. With the fifth anniversary of his stores coming up, he wanted to do something memorable – while sending that message at the same time. 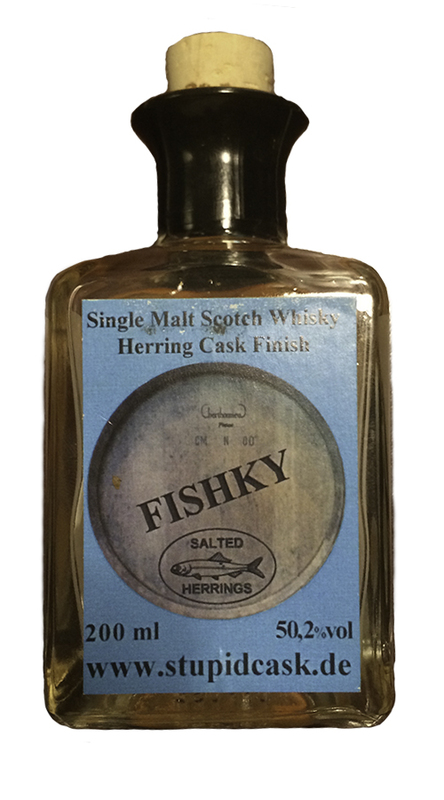 That’s right…a herring cask finish. While others were trying to find rare wine, rum, and other types of casks to finish their whiskies in, Pinkernell wanted to return to a part of Scotch Whisky history where whiskies were kept in any kind of barrel that could hold liquid…including the briny sea water used to keep herring fresh from port to market. Trouble is, those days were long past, and herring is transported in large plastic totes instead of barrels, and Pinkernell’s attempts to source a herring cask were unsuccessful. “I found a fish trader just outside Berlin who was willing to help out, but obviously, he had the fish but no cask.” A cooperage near Berlin just happened to have a freshly-emptied red wine cask, the fish trader filled it with herring fillets, and Pinkernell arranged to get that cask of 14-year-old Bruichladdich moved from Campbeltown to Germany. 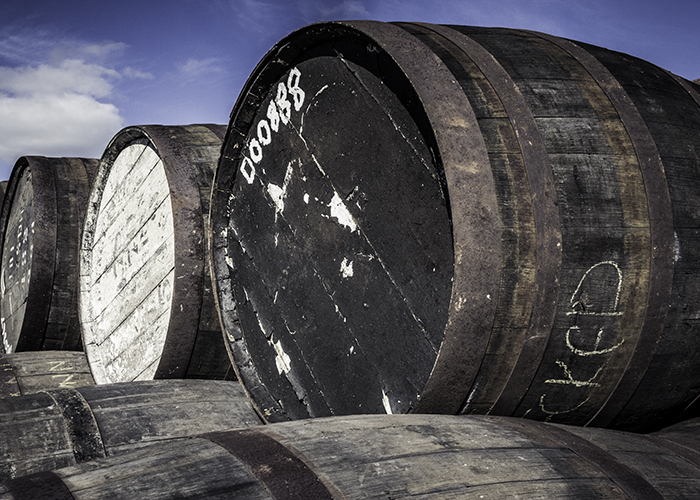 At the time, it was still legal to export whole casks of single malt whisky from Scotland. The practice has since been banned, though Pinkernell’s diabolical project had nothing to do with it. After six months of “seasoning,” the herring and red wine cask was ready to be filled with whisky. At this point, Pinkernell hesitated briefly. At this point, asking that question and answering it with the likely reality of ruining an entire cask of vintage single malt whisky worth thousands of dollars might have dissuaded most people from plowing ahead. Klaus Pinkernell is not most people. He decided to only use half of the Bruichladdich cask and keep the rest of the whisky in its original cask. Six months later, he hand-bottled both casks for the fifth anniversary of the shops. The whisky from the Bruichladdich cask carried a standard Cadenhead’s label, while the whisky from the herring cask bore a label that will live infamously in whisky history. As one might expect, there was a great deal of hyperventilating and clutching of pearls among the whisky purists of that time, and Pinkernell eventually decided to pull his remaining bottles of Fishky off the market. As the legend of Fishky circulated on the Internet, he kept getting inquires about whether any bottles might still be available. Since Fishky was bottled in 200ml bottles, he still had – and has – some for sale through what’s now known as Pinkernell’s Whisky Market. Fast forward to October of 2014. I was visiting the Inver House distilleries in Scotland with a small group of writers when we did an online Twitter tasting in the conference room at Balblair Distillery in Edderton. Distillery manager John MacDonald had just led us through the Balblair single malt range and we’d all put our smartphones and tablets down when he said something I’ll never forget. 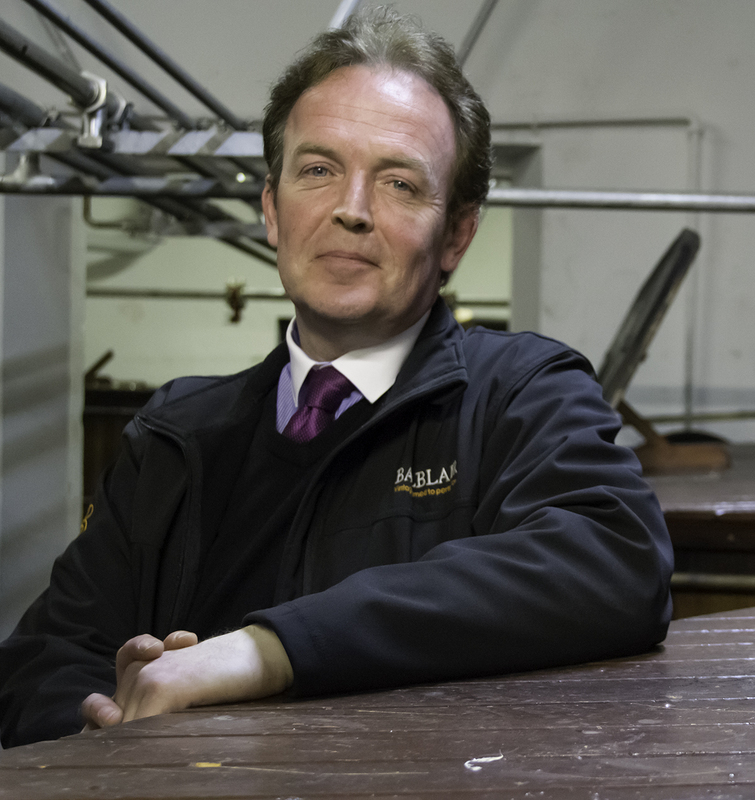 Balblair Distillery manager John MacDonald had a subtle grin on his face shortly before the infamous Fishky tasting. He brought out a tray of Glencairn glasses, and we started nosing them. Briny aroma, but something not out of place in a whisky matured near the ocean. The nose was keeping a secret, though…a secret that became instantly apparent as soon as I took a sip. These are my tasting notes from that night, leading to a score of 40 out of a possible 100 points. The nose hides the secrets of this whisky well, with notes of malt, brine, and heather. The taste reveals all, though, with sour butyric baby vomit, brine, and stomach acid. The finish is salty, greasy, and nasty with no redeeming qualities. “You impressed me very much that day, Mark,” John MacDonald said this week in a telephone interview. “You were one of the few people that reacted as I reacted when I tasted it…as you know, there’s a few other people sitting at that table who will remain nameless that were saying this, that, waxing lyrical about it,” he said.”I’ll never forget it, Mark…I’m sorry. It was a bit cruel, but it was for my amusement,” he laughed. MacDonald doesn’t remember where that bottle of Fishky came from. Klaus Pinkernell knows exactly how it got to Balblair. “I do remember that I was at Balblair Distillery and I left these bottles there, so the bottle that you had was one that I actually brought to Balblair myself,” he said. There’s an argument for tasting bad whiskies, since they help you appreciate the good ones all the more. One sip of Fishky is enough to lock in that appreciation for a lifetime, though. On June 22, 2018, half of Warehouse 30 collapsed at the Barton 1792 Distillery in Bardstown, Kentucky, spilling around 9,000 barrels of whiskey. The rest of the warehouse collapsed on July 4 with another 9,000 barrels. Crews have been working since then to recover as many barrels – and as much Bourbon – as possible. The site is closed to reporters, but Sazerac has released a video and new images showing cleanup work at the warehouse site. July 26, 2018 – To show their unity, leaders of the nine major whisky trade organizations planted an American White Oak tree on the corner of 9th and Main Street outside the Frazier History Museum in downtown Louisville following their first-ever summit meeting. Even before the first shovel of dirt was turned, observers noted that the raised brick-lined bed had routinely been damaged by vehicles using 9th Street to merge onto Interstate 64 and wondered how long the tree would last before being wiped out by a recklessly driven truck. It’s an apt metaphor for the state of the whisky industry weeks into a global trade dispute pitting the United States against many of its most important global trading partners, many of whom have imposed punitive tariffs on imports of American-made whiskies to retaliate for the Trump Administration’s tariffs on their exports of steel and aluminum to the US. Years of growing global whisky sales spurred by reduced – or eliminated – import tariffs are now threatened as whisky has become one of many pieces in play in a political game of “chicken.” With their collective futures at stake, the Kentucky Distillers Association invited colleagues from the other trade associations representing the world’s major whisky and distilled spirits producers to a two-day conference in Louisville. 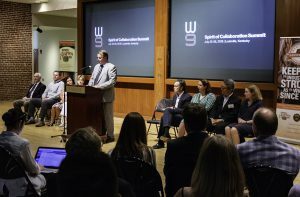 “Together, we form the W9, or the ‘Whisky 9,’ to serve as an open exchange of ideas, strategy, and a shared commitment to preserving free and fair trade,” KDA President Eric Gregory announced at a news conference following the closed-door “Spirit of Collaboration Summit.” As an example, Gregory cited the significant growth of whisky traded between the US and the European Union following the elimination of most tariffs in 1997 and similar expansion in trade with Canada following the elimination of tariffs in 1995 with the North American Free Trade Agreement. The summit started late Wednesday, hours after a White House meeting between US President Donald Trump and European Commission President Jean-Claude Juncker. That meeting, while not producing any concrete agreements, resulted in both sides agreeing to hold off on additional sanctions against each other while negotiators work toward a resolution of the original dispute over steel and aluminum trade. 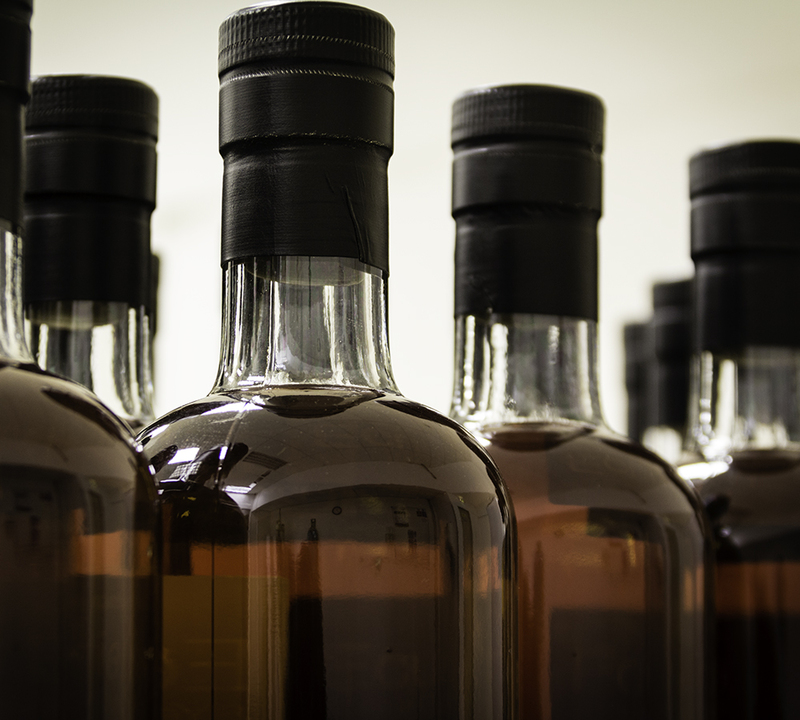 If – and only if – an agreement on that issue can be reached, it would clear the way for the European Union to remove its tariffs on American-made whiskies and other exports. The pause in rhetoric would appear to delay the retaliatory moves threatened by the Trump Administration following the tariffs imposed by the EU, Canada, China, Mexico, and Turkey over the last month. The administration’s public position has been that retaliation could come in the form of new tariffs on imported cars and auto parts. While Japan has not yet joined the list of countries targeting American whiskies, Jun Tanaka of the Japan Spirits & Liqueurs Makers Association predicted his country would likely follow suit if the US made that move. “I think our government has tried to persuade the US government in a quiet way,” he said in an interview. “If things come to cars and automobile parts, an important Japanese product, they would think about retaliating.” Tanaka also pointed out that his country is also being affected by the current tariffs on American whiskies, since Suntory (Beam) and Kirin (Four Roses) have significant investments in the United States. While some of the large American whisky makers have been able to minimize the impact of tariffs on their export sales by shipping extra stock to Europe and Canada in the first half of 2018, the largest impact so far has been felt by craft distillers. Margie Lehrman of the American Craft Spirits Association represented her members at the summit, and noted several instances where the trade dispute created problems even before the imposition of tariffs. Lehrman and her colleagues also cited the ripple effect of tariffs throughout the economy, especially for agricultural-based products like whisky. The effect has been felt widely throughout the agriculture industry, which was promised up to $12 billion in assistance by President Trump this week. However, the tariffs reach all the way from agriculture to transportation, the manufacturers who produce bottles and packaging, and other industry sectors. Gregory’s team put together the summit in just a couple of weeks, and he deemed it a success. While members of Congress were turned away after requesting to attend the meeting, they have been in regular contact with the KDA. It also appears the industry leaders will be in regular contact with each other following this inaugural summit, as Gregory noted. “I thought it was a good sign when we all met last night and got talking…and people were already talking about where to hold the summit next year,” he said. Listen to this week’s WhiskyCast for more coverage of the Spirit of Collaboration Summit. With the ongoing trade dispute between the US and Canada, it’s important to keep in mind that Canadian Whisky remains extremely popular in the US. Crown Royal has released the latest edition in its Noble Collection series – a 13-year-old “Blender’s Mash” using one of the five different styles of whisky Crown Royal makes at its distillery in Gimli, Manitoba. They call it a different name at the distillery, though…and when they tried to use that “Bourbon Mash” name in the US…let’s just say it didn’t go quite as planned. James Yoakum opened Cooper River Distillers in 2014 in the heart of Camden, New Jersey – just wanting to make good whiskies and rum. He and his team did just that, but they learned an important lesson along the way: size matters. They couldn’t make enough whiskey and rum to meet the demand, but they also couldn’t make enough money to expand the distillery. Faced with that dilemma, Yoakum decided to close the distillery with one final Kentucky Derby party on May 5, 2018. March 27, 2018 – Whiskey lovers and whiskey makers often argue over how much difference the wood in a barrel can make in the taste of a whiskey. While there’s no set answer, it’s estimated by experts that the wood can be responsible for 70 percent or more of the flavor in a whiskey. During the maturation process, spirit soaks into the wood and extracts flavors created by the breakdown of cellular compounds in the staves, while the wood also removes less desirable flavors from the spirit over time. Rarely, though, do we get a chance to compare the actual differences wood can make in a single whiskey. 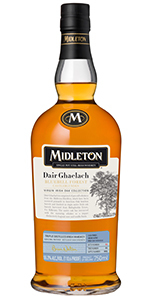 Midleton’s Dair Ghaelach “Bluebell Forest” Irish Whiskeys give us the chance to do just that, though. As part of a long-term project to help restore Ireland’s forests, Irish Distillers Pernod Ricard has been working with forestry experts to identify stands of sustainably managed Irish Oak that could be used to make whiskey barrels. The initial “Grinsell’s Wood” 2015 release of Dair Ghaelach used ten specially selected trees to produce barrels that were used to mature the same Midleton single pot still spirit, with the wood from each tree kept separated from the others. At the time, the whiskey from each tree’s barrels was destined for a separate market as well. Just as with the first release, the wood from each of the six trees felled in the Bluebell Forest on the Castle Blunden Estate in County Kilkenny was kept separate during the coopering process and the whiskies from each tree’s barrels was also kept separately from the others. However, the six bottlings in the Bluebell Forest release are all being distributed globally in limited amounts, making it possible for whiskey lovers to try more than one and see what difference the wood actually makes on the final whiskey. 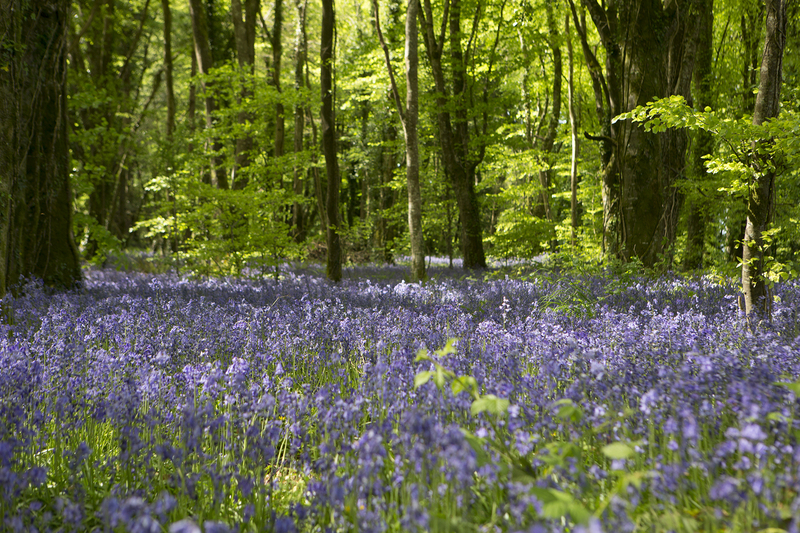 The Bluebell Forest at Castle Blunden Estate in Ireland. Photo courtesy Irish Distillers Pernod Ricard. The nose has hints of lemon zest and butterscotch, along with straw, honey, and soft spices. The taste is tart with lemon pepper, while classic pot still spices of clove, cinnamon, and allspice develop slowly in the background along with touches of vanilla and straw. The finish gently fades away with a nice lingering tartness. Score: 92 points. Much different than Tree #1, with a complex and slightly dry nose full of dark fruits, soft oak, honey, brown sugar, straw, and caramel candy. The taste is dark and spicy with notes of plums and raisins at first, followed by a crescendo of pot still spices and background notes of honey, vanilla, red grapes, and apples. The finish is very, very long with mouth-tingling spices that stick to the tongue. Wow! Score: 96 points. This one has fresh-cut oak sawdust on the nose, along with honey, caramel candy, soft spices, and a hint of butterscotch candies. The taste starts off dry and oaky, then comes alive with clove, black pepper, cardamom, and allspice while honey, vanilla, straw, and a hint of dark chocolate add complexity. The finish is long – it sits on the tongue for a while and long enough to think about charging it rent! Score: 95 points. The nose has notes of pencil shavings, honey, plums, blackberries, and a hint of brandy. The taste is thick and mouthcoating with great pot still spices of clove, black pepper, and allspice balanced by honey, caramel candy, and blackberries in the background. There’s a hint of anise that develops late and sticks around through the long finish with lingering spices, honey, and a soft hint of oak. Wow! Score: 95 points. The nose on this bottling is soft and subtle with honey, oak sawdust, butterscotch, and a hint of lemon zest. Spices develop slowly on the palate and build to a peak with clove, white pepper and allspice complemented nicely by honey, linseed oil, and a hint of anise underneath. The spices provide a nice bite with good overall complexity. That spicy bite lasts through the finish with anise, honey, and butterscotch notes underneath. Score: 93 points. The nose is very aromatic with hints of pine and cedar balanced nicely by honey, berry cobbler, and muted spices. The taste is mouth-coating, rich, and full of pot still spices that don’t overpower the sweeter notes of honey, butterscotch, straw, and a hint of citrus tartness. The finish has that slight tartness with long, lingering spices. Score: 95 points. While there’s an overall consistency in many of the flavors between the six Dair Ghaelach Bluebell Forest bottlings, it’s clear that each of the six trees helped contribute to the final whiskeys by playing up some flavors while downplaying others. Normally, these differences would never make it to the bottle. Not only would those differences have been minimized in blending, but the common practice of coopers to use staves from different trees when making barrels would have effectively negated the influence of a single tree on the whiskey. That said…I found all six bottlings to be complex, well-rounded, and very, very drinkable. Give me a choice between them, though – and I’d have to pick the whiskies from #2 and #4, but not by very much. Editor’s note: Thanks to Irish Distillers Pernod Ricard for providing samples of all six Midleton Dair Ghaelach Bluebell Forest bottlings for this story. January 2, 2018 – As a journalist, I spend much of my time covering news that has already happened. There isn’t always as much time to anticipate who may or may not “commit news” in the short-term future, and of course, it’s risky to commit predictions to paper – or pixels – for public consumption. On New Year’s Day, one of my Twitter followers, Dave Parker (@MaltTroll), challenged me to do just that, though. Now, it would be easy to come up with a humorous and possibly even snarky list of predictions, and I’ll even admit that I thought of a few. The hard thing is to come up with ten serious predictions and be able to back them up with logical reasons for each one. Will 2018 be a bright, sunny year for the whisky industry, or more like the label on the barrel at top right? Some of these may not happen until 2019, and some may not happen at all, but I have a bit of a track record for this stuff. Back in 2010 during a session at the World Whiskies Conference in Glasgow, I predicted that one of Scotland’s major distillers would invest in the U.S. craft whiskey sector within five years. My reasoning was based not on the emerging consumer interest in small-scale distilling, but because an investment in a U.S.-based distillery would allow a Scotch Whisky maker to experiment with new product development while neither affecting current production nor running afoul of the laws limiting Scotch Whisky production. Several months later, William Grant & Sons acquired the Hudson Whiskey brands from Tuthilltown Spirits and went on to buy the entire company in 2017. My only regret is that I’ve forgotten the name of the other panelist who laughed at that prediction and promptly bet me £100 that it wouldn’t happen – I’ve never been able to collect on that bet. That said, here are my ten predictions for what may – or may not – happen in the whisky business during 2018. 1: Whisky prices will continue to go up worldwide as demand increases, especially for rarer expressions. This one’s a no-brainer, given that whisky prices have been increasing consistently over and above the rate of inflation as worldwide demand for whisky continues to grow. The corollary is that the number of consumers who complain about rising whisky prices will also continue to grow, and I’ll address that later. 2: We’ll see several more acquisitions of small distilleries by the industry giants, but the trend will expand even more outside the USA. Most of the recent acquisition spree took place in late 2016, with deals closing or being announced in early 2017. Möet Hennessy’s July purchase of Woodinville Whiskey Company in Washington was the only major U.S. deal of the year, but I wouldn’t be surprised to see three or four craft distilleries change hands this year once the impact of the new U.S. tax reform legislation on corporate finances becomes clearer. We don’t have a good handle of how much cash U.S.-based companies like Sazerac and Brown-Forman may be holding overseas for tax reasons, and the changes to the tax code designed to repatriate some of those funds might spur some acquisition deals. 3: Those acquisitions will not just be complete buyouts, but minority investments designed to hedge their bets for the future. Diageo (Distill Ventures) and Pernod Ricard USA (NBV Investments) both have in-house units looking for investment opportunities in the craft distilling sector. Until now, most of Diageo’s investment has been outside of the U.S., with minority stakes in Denmark’s Stauning Distillery and Starward Distillery in Australia. NBV Investments was responsible for the Smooth Ambler acquisition in late 2016. While that was a complete buyout instead of a minority stake, it was structured in a similar fashion with co-founder John Little remaining in place after the sale closed. 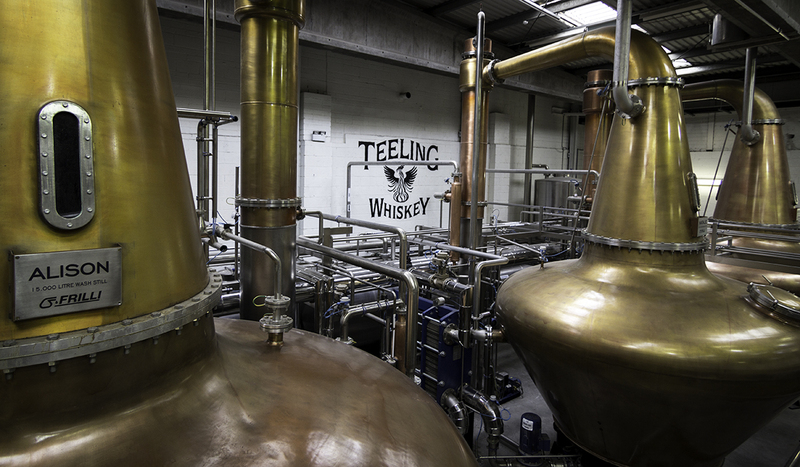 The stills at Teeling Whiskey Company in Dublin, Ireland. The best example of this in 2017 was Bacardi’s move to acquire a minority stake in Ireland’s Teeling Whiskey Company along with the U.S. distribution rights. That deal gave Bacardi a piece of the growing Irish Whiskey market to go along with its Scotch Whisky (John Dewar & Sons) and Bourbon (Angel’s Envy) portfolio. 4: The flavored whiskey craze will finally start to die (and not too soon!). 5: The push for an official “American Single Malt” designation will gain some momentum outside of Washington, but will be caught up in the Trump Administration’s deregulatory push and not be approved this year. Given that the Trump Administration’s current policy is that “two existing regulations need to die for every new one that’s approved,” I don’t see this happening in 2018. We’ve already seen examples where the Treasury Department’s Tax & Trade Bureau process for approving new American Viticultural Areas (AVA) for winemakers has been affected by the policy. Only one new AVA was approved in 2017, and according to Wine Searcher, 18 more are waiting for final approval, with some on the waiting list since 2015. Given that the TTB has not yet opened a formal rulemaking proposal to add an American Single Malt standard to the Standards of Identity list for whiskies, I don’t see this happening until at least 2019. 6: Look for some of the whisky makers that released no-age-statement whiskies several years ago to gradually bring back 10 or 12-year-old editions as maturing whisky stocks catch up. We’ve already seen at least two indications of this. Chivas Brothers recently indicated that it will gradually start to reintroduce The Glenlivet 12-year-old single malt in many global markets where it was replaced in 2013 by the no-age-statement Founder’s Reserve. In addition, when it introduced the Ballantine’s Single Malt Collection this fall, all three malts from Glenburgie, Glentauchers, and Miltonduff carried 15-year-old age statements, when it would have been just as easy to introduce them to the market without an age statement. It’s probably still too early for Nikka to start bringing back age-statement whiskies after supply shortages forced it to replace the entire range with no-age-statement whiskies a couple of years ago. Other distillers that made similar moves are likely to start using age statements as soon as they can. Whisky bottles ready for labeling on the bottling line at Duncan Taylor & Company in Huntly, Scotland. 7: Exports of Bourbon and Tennessee whiskies will continue to expand in 2018, but begin to slow down late in the year when the U.S dollar gains strength against the British pound and Euro as the Brexit breakup deadline gets closer. There’s one word that describes the Brexit mess right now, and it begins with “cluster…” Great Britain’s exit from the European Union comes in March of 2019, and there has been little progress toward a resolution on post-Brexit free trade between the two sides. The markets despise uncertainty, as we saw in June of 2016 when the pound crashed following the U.K.’s Brexit vote. Without some form of a trade agreement in place by the current deadline this autumn, don’t be surprised if the currency traders respond by switching to U.S. dollars in a search for stability (though the U.S. midterm elections in November will bring their own concerns about stability). The pound’s post-Brexit vote crash against the dollar led to increased Scotch Whisky exports to the U.S., while raising prices for Bourbon and Tennessee Whiskey exports to Great Britain. While American whiskey exporters can count on selling to more markets than just Great Britain and Europe, both represent a significant percentage of annual export sales and a late-year slowdown in shipments is not out of the question if currency markets swing on political issues. 8: The long-predicted shakeout in U.S. craft distilling will largely be avoided because of the cut in Federal Excise Tax that should help struggling distillers. Those that do go under would have done so with or without a tax cut because they weren’t financed well to begin with. While the overall tax reform legislation signed into law just before Christmas has plenty to criticize, depending on where your individual priorities lie, there is no question that small distillers benefitted the most from changes to the tax code. Yes, the big distillers will gain from saving almost $1.1 million dollars in tax on the first 100,000 proof gallons they remove from bonded storage for sale each year, but for distillers that sell millions of cases of whiskey each year, the tax savings will be a blip on the radar for the accountants. Until now, small-scale distillers have been counting pennies while they wait for their whisky to mature, only to be hit with a whopping tax bill as soon as they’re ready to start selling. For a craft distiller who only removes 25,000 gallons of whisky from bonded storage in a year, the tax bill will drop from $342,500 to just $67,500. That $275,000 in savings could mean the difference between a profitable year or another year of losses for many small-scale distillers. 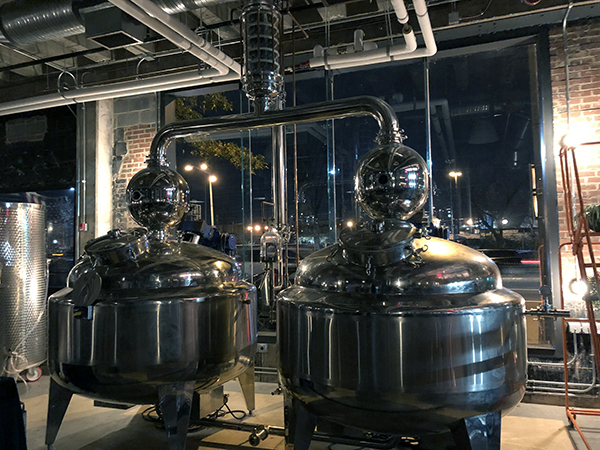 The stills at Republic Restoratives, a craft distiller in Washington, DC. 9: Whisky sales in the USA will show slight gains in 2018, but increasing competition from tequila and other brown spirits could be a sign that prices are rising too fast for consumers. Never underestimate the fickleness of the American consumer. Brand loyalty – especially in the drinks business – is a fantasy, and most people are looking for something new and unusual to drink. They want bragging rights in their circle of friends for being the one to jump on a new trend first, and that’s part of the reason for whisky’s booming sales over the last decade. Given that prices are rising for most whisky categories – especially the premium ones – the point is coming where more consumers will be priced out of the market and start to look for alternatives. While they may switch from mainstream brands to craft whiskies for the “artisan” or “local” flair, many craft whiskies already are priced at premium levels that could discourage some consumers. That opens up a market for producers of tequila, rum, brandy, and other brown spirits to come in at lower prices and take some of whisky’s market share. 10: Look for several of the small distillers in Scotland that have opened in the last 3-5 years (or are being built now) to merge their business operations as a way to save money and create economies of scale for purchasing grain, barrels, bottles, and other commodities. At least a dozen new distilleries have opened in Scotland over the last three years, and as many as ten more may open this year. Their backers are betting on continued growth of Scotch Whisky sales globally, but the annals of Scotland’s history are filled with stories of distilleries that went under because supplies exceeded demand…and the costs of doing business greatly exceeded revenues. Here’s another area where distillers might want to remember the past. Back in 1877, six of Scotland’s major distillers merged to form the Distillers Company Limited, which went on to become the dominant force in the Scotch Whisky industry for many years and is one of the ancestors of today’s Diageo. In 1966, the three families that dominated Ireland’s whiskey industry realized they needed to merge together to succeed or all three would fail separately. They formed Irish Distillers, paving the way for the eventual comeback of the Irish Whiskey sector, and their successors are now sharing best practices and techniques with many of Ireland’s startup distilleries. While each of the small-scale Scottish distillers have their own style of making whisky to meet the expected demand, their chances of future success could be greatly improved by teaming up on the business side. A consortium of small distillers might well be able to negotiate better prices for barrels, grain, bottles, and other commonly-used supplies and services. In addition, shared back-office functions could cut the costs for all members, along with providing technical support and mutual assistance as needed. Distillers have a long tradition of helping each other out when needed, and if investors are willing to put their egos aside, a partnership like this might lead to greater profits in the future. There are plenty of other predictions that could have been added to this list, such as increased expansion in visitors centers and tourism, along with the overall expansion of distillery capacity, but there also remain plenty of questions to ponder. Will the growth of Taiwan’s Kavalan and other “world whiskies” pose a serious challenge to the industry’s longtime leaders? Will craft distillers continue to increase market share by attracting new consumers, taking sales away from larger brands, or will they feed off each other by competing for the same share of the market? Are we oversaturated with whisky festivals around the world? Will Jim Murray pick a Scotch Whisky as his Whisky of the Year in the 2019 Whisky Bible? Right now, I’m guessing “maybe,” “all of the above,” “possibly,” and “who cares?” Apply them to those questions as you see fit. Editor’s note: This commentary reflects Mark Gillespie’s opinions exclusively, and the views expressed here do not necessarily reflect those of WhiskyCast or its sponsors. Our policy is to label commentary as such to avoid confusion with the news stories presented on WhiskyCast.com. All photos ©2018, Mark Gillespie/CaskStrength Media. What’s it like to taste five rare whiskies worth $60,000? 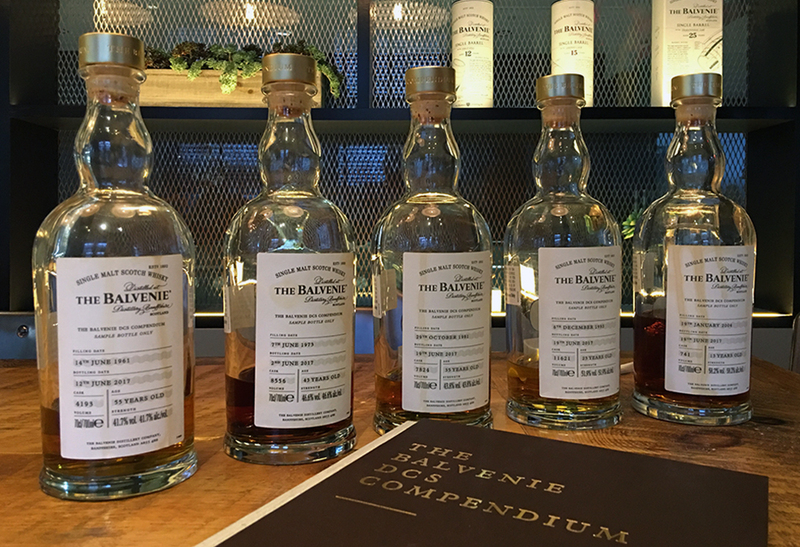 In our latest “One on One” tasting, we’ll sit down with Gemma Paterson of The Balvenie to taste Chapter 3 of the DCS Compendium: five single cask whiskies selected by longtime Malt Master David Stewart MBE. Stewart selected a total of 25 casks in 2015 that represent the breadth and depth of his work at The Balvenie over 55 years, with the five casks to be released each year representing a different element of the whisky-making process. Chapter 3 has been dubbed “Secrets of the Stock Model” to represent Stewart’s record in managing the distillery’s cask inventory through both good and bad times for the Scotch Whisky industry. The casks in this chapter range from a 13-year-old cask filled in 2004 to the oldest bottling ever of The Balvenie: a 55-year-old cask filled in 1961 – the year before David Stewart joined William Grant & Sons as a member of the whisky supply team. Only 50 sets of each chapter are available worldwide, with a recommended retail price of $60,000 each. While the complete set of Chapter 3 bottles is priced at $60,000, there is a much less expensive way to taste them. 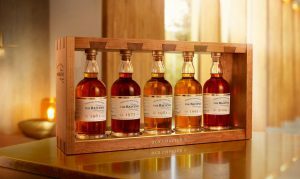 The Four Seasons Hotel in New York City acquired a set for its Ty Bar, and offers a tasting flight of all five whiskies for $5,000. Corby’s release of the four whiskies in the Northern Border Collection Rare Release series should be enough to convince even the most diehard skeptic of the potential to be found in Canadian Whiskies. 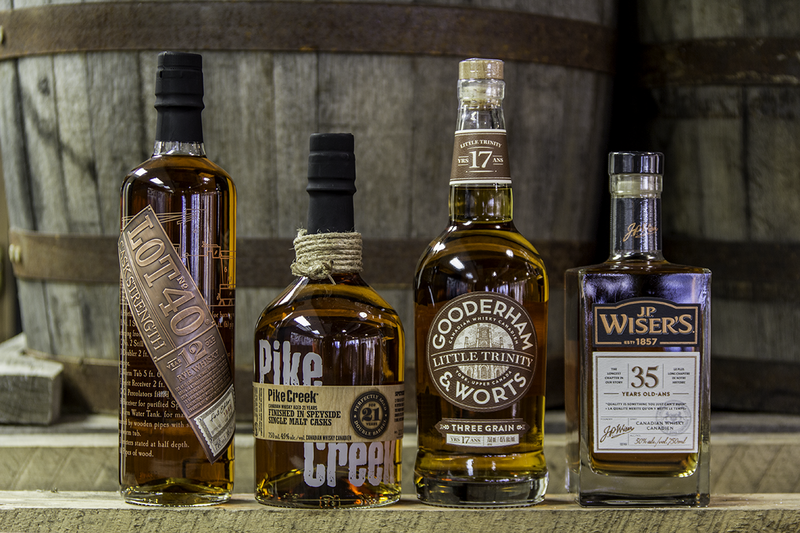 J.P. Wiser’s 35 is one of the oldest Canadian Whiskies ever bottled, while the Lot 40 Cask Strength, Pike Creek 21, and Gooderham & Worts Little Trinity each offer a unique take on their counterparts in the regular Northern Border Collection range. All four whiskies were created by Master Blender Dr. Don Livermore at the Hiram Walker Distillery in Windsor, Ontario. During a visit to the distillery in October, 2017, he and WhiskyCast’s Mark Gillespie sat down to chat while tasting all four whiskies. This is the first in an ongoing series of “One on One” tastings that will appear exclusively here at WhiskyCast.com. While the series will be repeated in future years, the four whiskies in the 2017 release will only be available in limited quantities within Canada. Prices range from $69.95 CAD ($55 USD) for the Lot 40 Cask Strength to $164.95 CAD ($129.50 USD) for the J.P. Wiser’s 35.